The orders came from a man known only to the gang as "Thep So-Lo". He ordered the hit via Facebook and demanded that a video be taken to prove what had happened. The suspects in custody - whose ages range from 16 to 23 - have told police that the hit order came from a man they didn't know but who was not paid for drugs dealt by the victim. The victim was 17 year old Kurusat who has been named under the moniker "Red Ban Toom" in the media. 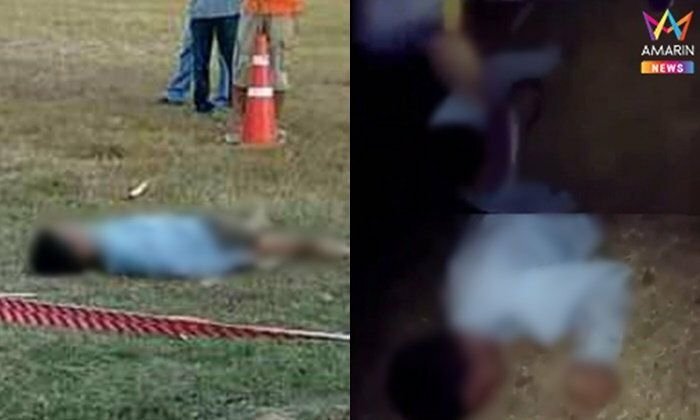 Meanwhile two of the suspects named only as "Bas" and "Ball" have said they were invited by elder friends to take part and felt pressured by Thai cultural mores (graeng jai) to go along. They said that they only did one kick each and it was their understanding that the victim was just going to be given a "warning" but not murdered. well then, no problem. whats for lunch? How would the victim be able to accept the apology? "They apologized to the victim saying it was a mistake to kill him." ... I am sure he forgives them. Oh wait, no, he can't, because he's dead! For less than a grand apiece? Life is cheap in Thailand, and getting cheaper by the minute!!! But glad to hear that murder for hire is so inexpensive and easily arranged here -- just pop on Facebook, offer a few thousand baht, and people you don't know are willing to take on the job.... Amazing!!! only one kick each....so two kicks twice as bad? Why you guys farang always so serious?? sabaai sabaai....shoe shoe.. It's not clear from the article that the guy who ordered the murder on Facebook was arrested or not. He should be prime suspect #1. Thai kids are just learning nothing. A big majority of them simply has very poor family values or education. What never ceases to amaze me is how the Thai police get all these criminals to actually ADMIT they did the crime. And then, in many cases, they take them to the scene and video record them as they "re-enact" the crime. And that seems to work with Pharangs, too. Maybe, we only hear about the ones that confess. In fact, I guess that would make sense. If they claim they're innocent, their faces shouldn't be plastered all over the media sites.